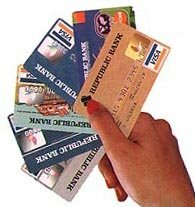 Anywhere you look, financial advice will unequivocally point towards paying off your credit cards first. But if you are like most people, with even a small amount of credit card debt, this task looks more daunting than they make it sound. So you finally decide to sit down and do the math, to see how you can pay this bad boy off, only to discover that you’ll be paying the plastic off for what feels like the rest of your life. fought down his credit cards back in his mid-twenties and that’s where he really began prospering financially. I made it out of college and spent three years traveling around the globe without a single credit card payment due, thinking I was homefree. It all started when I moved into my bachelorette pad in Portland, Oregon. Blame it on a crappy economy or living in bachelorettehood, but it was evident when I moved out to DC a year later that this was top on my list of priorities. After thinking I would never fall into the credit card trap, it had happened to me. Now it was time to fight back! The good news, there is hope! You can do this! What a sweet victory it will be. 2) In that plan, I found a 0% credit card that bought me one year to pay off the plastic. This was an essential step to making sure your efforts go towards the principle. 3) I carefully created a budget and stuck to it. 4) After planning out my budget, I took all possible disposible income and set an automatic payment to the credit card. This is key, as credit cards will ding you for not making payments on time. This can cost a lot in the long term. 5) Perhaps the most important step: at each pay day, I would pay off and project all bills and expenses that were expected in the next two weeks. Then I would take whatever the balance was, and send it straight to the credit card company. This meant that all I had available to spend was what I needed for basic expenses. It may seem a bit drastic, but it was so worth it. 6) I avoided fees at all costs. When you are in the credit card spiral, they do their best to try to stick you with every fee under the sun. I was adament about reviewing my bill and calling to contest any fees. It may have taken some kind persistence on my end, but I believe that I saved about $400 in fees that year. This was all done by paying attention and learning how to talk your way out of these things with a phone agent. A skill that will pay off in dividends. My goal was to pay off my credit card in one year. When I set the goal and did the math, it didn’t look possible. I put my faith out there and set the date early even though it looked nearly impossible. As it was, I finished three months ahead of my goal. To give you a better idea of what I achieved (to give you hope): I paid off around $13k of debt, while I was making $35k at the time, and living in a very expensive city. Yes, you’ve done the math right, at some points I was paying half of my take home salary towards plastic. I did all of this without starving, and still went back to visit my family once, and went out to Hawaii to visit family and get proposed to. :-) Yes, even you can do it! Perhaps the greater lesson that paying off credit cards alone, was that this financial diligence prepared me to better meet my future financial plans. I moved from paying off my credit card debt to saving for a house without blinking an eye. We moved on directly from house savings to wedding savings. Now we are just finishing up with honeymoon savings and will move towards maxing out our retirement plans and building our stock portfolio. Take one step and you are on your way. It isn’t easy, but it feels so good!